Previously, I introduced you to the “Three S’s of Organizing,” an easy and effective three-step approach to getting organized. The “Three S’s of Organizing” are simplify, sort, and store. I’ve already discussed simplifying and some simplifying challenges, and today, I’d like to move onto the second S, sort. Even though I’ve talked about simplifying the first, and then sorting, they do not have to be done in that order. You can do either first, or you can do them both together. I would estimate that 50% of the time it works better to simplify first, 50% of the time it works better to sort first, and 50% of the time it works best to do them both together. If simplifying is easy for you, I recommend simplifying first because then you don’t spend time sorting items you’re just going to get rid of anyway. However, if you find that simplifying is difficult or time-consuming for you, or you’re getting dragged down in it, it may be easier to sort first. After sorting, it’s easier to comprehend what you have. It’s easier to take stock of your possessions and see what’s unnecessary. It will then be easier to simplify. If you view a possession in isolation, it may be hard to really know if you need it or not, but when you view it in the context of all the other stuff that’s similar to it, it’s easier to see redundancies and to see when the quantity of possessions is out of proportion with their value in your life. In general, if it is easy to let something go, let it go immediately, otherwise, sort it. There are a number of different reasons to sort your stuff. I’d like to point out three of them. First, when you sort your stuff, it becomes more comprehensible. Imagine a room with 4587 unsorted objects. It’s nearly impossible for your mind to be able to comprehend what objects are in that room. On the other hand, if all those objects have been sorted into categories it’s much easier to get a sense of what’s there. Your mind can comprehend 24 categories much easier than it can comprehend 4587 individual objects. Second, when you sort your stuff, it becomes easier to find and access. Suppose you want to find something in the aforementioned room, like a stapler, for instance. You know it’s there somewhere, but you can’t remember specifically where. If the room is unsorted, you’ll have to look through 4587 individual objects to try to find it. But if the contents of the room have been sorted, you merely have to look through whichever category corresponds to the stapler, which might be office supplies, for example. This will undoubtedly be much easier because the category contains a much smaller amount of stuff than the entire room. So these two benefits come from having your stuff sorted, even if your stuff was sorted by somebody else. But, beyond that, you get a third benefit from actually going through the process of sorting. This is because memory is associative. Your mind keeps track of information through its associations and connections to other information. When you sort, you are building associations and recognizing similarities and relationships between objects. You can’t help it — it’s an inherent part of the process. Regardless of what categories you create and how you place different objects into those categories, just the process of sorting itself will help you keep track of what you have. The process of sorting is quite simple. 1. Go through the belongings to be sorted. 2. For each item, decide which category you want it to belong to. 3. Physically place the item in that category. If the category doesn’t exist, create it. Use temporary sorting containers if necessary. When you sort, categorize based on how you think about the objects. There can be a large amount of creativity and flexibility in how you sort. One person might put blank CDs with music, another might put them with computer supplies, while someone else might categorize them as office supplies. You might sort shirts by dress or casual, by short-sleeved versus long-sleeved, by type of collar, by color, or by a combination of these. One client I had stored clothespins with laundry, and another one stored them in the kitchen, because she used them mostly as chip clips. You sort based on how you use that item, and consequently how you think about it. Sorting is a skill that, like any other skill, gets easier with practice. There is no wrong answer. There is no “standard” sorting system, and I wouldn’t recommend it if there were. There is no perfect or best solution; there is only the way you use an object, and how you think about it. Furthermore, there is no wrong answer because just looking at an object and consciously evaluating it is going to help you remember how it is categorized, and that, ultimately, is the goal. As you’re sorting, there’s one thing to watch out for. Make sure you don’t pick something up, look at it, and then put it down again. If you do this, you’ve invested time and energy but you haven’t made any progress. Make sure you put the item with its category. If no category exists, create one. When you first start to sort, you may need to be a category-making machine, but after you create an infrastructure of categories, the process will go more quickly. I offer the following four recommendations to help your sorting flow more smoothly. First, start with categories you already have. It’s likely you have some categories already, and it’s better to use them than to start from scratch. Second, keep it simple. The simpler your categorization is, the easier it will be to create, use, and maintain. And especially, make sure you don’t spend more time categorizing items than you will save when you access them. For example, I used to have just one file folder for all my credit card statements, even though I had credit cards from several different companies (this was before I went paperless). I could’ve sorted the statements by bank and then by date, but I didn’t — I just threw them all in one folder. This worked really well because I didn’t ever access the statements. I just shredded them at the end of the year. It wouldn’t have been a good use of my time to spend an hour sorting and categorizing these statements since I wasn’t going to save any time accessing them. If, on the other hand, I had used the statements more regularly, it might’ve been worthwhile to create more refined categories to allow me to access a statement without having to look through so many others. Third, start with broad, general categories, and then, if and when it becomes necessary, further refine those categories into more specific subcategories. In other words, do macrosorting before microsorting. This will keep you from getting too wrapped up in details at the start of the process. Fourth, separate between sorting and processing. Sorting is categorizing only. Processing is taking some action on the stuff you are sorting, like reading, making a phone call, sending email, or fixing something that is broken. For example, if you’re sorting articles, it’s important to not read all of the articles that you’re sorting. If you do, the process of sorting comes to a grinding halt. If you are sorting articles, read only enough to determine how to categorize the article, ideally just the title. Similarly, if you’re organizing the papers on your desk, and you end up spending a lot of time making phone calls, you’re not likely to get organized. It’s more efficient to focus first just on sorting. If you mix sorting and processing, you end up not doing either of them very well. When you do encounter things you need to do, and you know you will, I suggest you add them to a list. After you are more organized, you will be able to do two things you would not have been able to do earlier. First, you will be able to look over the list and see which responsibilities are most important, and start with the important ones first. If you take care of tasks as you encounter them, there’s a risk you may be spending time on tasks that are unimportant while failing to complete those that are more important. Second, after you are more organized, you will be able to take care of those tasks more quickly and efficiently, because you will be able to find everything necessary to complete those tasks. The most common question clients have asked me about sorting is, “What do I do when I encounter an object that could belong to two, or more, different categories?” The short answer is, “Put it in whichever category matches the item most closely.” Consider how it fits into the first category, then consider how it fits into the second category, and then decide which is a closer fit. Regardless of which category you choose, the process of considering and deciding will help you remember, in the future, where the item is. In this case, the mental process you go through to choose a category is more important than trying to find the “correct” category. There is no “correct” category, there is just how you think about the object. If you have considered the alternatives, and feel like the item applies equally to both categories, then pick one! The act of consciously evaluating the different alternatives and choosing one will help you remember how you categorized it. But if you’re still not sure you’ll remember, for some additional reassurance, you could create something called a cross reference. A cross reference is a note, picture, or some other pointer to the object and its location. For example, if you’re not sure whether to put blank CDs with music supplies or with computer supplies, you might put them with music supplies, and then place a note in computer supplies that says “blank CDs are with music.” Now once you make this decision, and then create the note and place that cross reference in the other category, you will almost certainly remember where the object is, without even needing the cross reference, but it is still there, just in case. If you happen to look for it in the other location, you will see the reminder of where it is. I have seen examples where, instead of creating a cross reference, someone will instead duplicate an item or a category. I strongly recommend against this and I’ll give you two examples to illustrate why. First, I’ll continue with the earlier example of the blank CDs that could be categorized either with music supplies or computer supplies. If you were to put half of them with music and the other half with computer supplies, it’s likely that over time you will start to use only one set of these and forget about the other. Eventually, you may end up buying new CDs because you mistakenly thought you had run out, when, in reality, you had a whole bunch more in another location. Now imagine, for the second example, you have a ten page document that could belong in either of two different file folders. If you copy that document, and place one copy in each folder, then this duplication causes the document to take up twice as much space as it otherwise could. Furthermore, suppose you want to modify this document. You’ll take the document out, write some notes on it, and then re-file it. Either you need to remember about the other copy and update it in the same way (which is more work to maintain), or else one copy will be out of date, and possibly have misleading or inaccurate information. This defeats the purpose of having multiple copies. So to avoid the pitfalls of duplicating items or categories, use a cross reference instead. I’d like to wrap up this discussion of the second ‘S’ by giving a quick review: sorting is creating categories. Put similar items together based on how you use them. If a possession could fit in multiple categories, pick one category to be the home for that item, and create cross references if necessary. 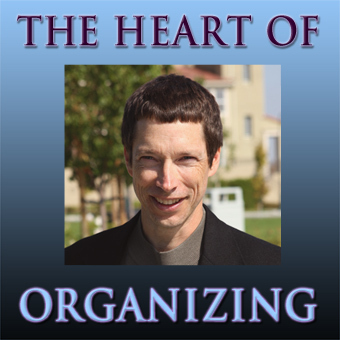 You are currently browsing the The Heart of Organizing: A Blog blog archives for February, 2010.